HAGATNA, GUAM, Washington Post -- This remote Pacific island is home to U.S. citizens who are fervent supporters of the military, as measured by their record of fighting and dying in America's recent wars. But they are angry about a major military buildup here, which the government of Guam and many residents say is being grossly underfunded. They fear that the construction of a new Marine Corps base will overwhelm the island's already inadequate water and sewage systems, as well as its port, power grid, hospital, highways and social services. "Our nation knows how to find us when it comes to war and fighting for war," said Michael W. Cruz, lieutenant governor of Guam and an Army National Guard colonel who recently returned from a four-month tour as a surgeon in Afghanistan. "But when it comes to war preparations -- which is what the military buildup essentially is -- nobody seems to know where Guam is." The federal government has given powerful reasons to worry to the 180,000 residents of Guam, a balmy tropical island whose military importance derives from its location as by far the closest U.S. territory to China and North Korea. The Environmental Protection Agency said last month that the military buildup, as described in Pentagon documents, could trigger island-wide water shortages that would "fall disproportionately on a low income medically underserved population." It also said the buildup would overload sewage-treatment systems in a way that "may result in significant adverse public health impacts." A report by the Government Accountability Office last year came to similar conclusions, saying the buildup would "substantially" tax Guam's infrastructure. President Obama had planned to visit Guam on Monday as the brief first stop of an Asia trip, but he delayed his travel because of Sunday's health-care vote in the House. Obama is aware of the problems here and had planned to promise some federal help, White House officials said. "We're trying to identify and understand the current conditions on Guam and the potential impact of the relocation," said Nancy Sutley, head of the White House Council on Environmental Quality, who on Tuesday will lead a delegation to the island. "There's no question that the environmental conditions on Guam are not ideal." Besides a new Marine base and airfield, the buildup includes port dredging for a nuclear-powered aircraft carrier, a project that would cause what the EPA describes as an "unacceptable" impact on 71 acres of a vibrant coral reef. The military, which owns 27 percent of the island, also wants to build a Marine firing range on land that includes one of the last undeveloped beachfront forests on Guam. In a highly unusual move, the EPA graded the buildup plan as "environmentally unsatisfactory" and said it "should not proceed as proposed." "The government of Guam and the Guam Waterworks cannot by themselves accommodate the military expansion," said Nancy Woo, associate director of the EPA's western regional water division. She said Guam would need about $550 million to upgrade its water and sewage systems. White House officials said the EPA findings are preliminary. Guam government officials put the total direct and indirect costs of coping with the buildup at about $3 billion, including $1.7 billion to improve roads and $100 million to expand the already overburdened public hospital. On this island -- where a third of the population receives food stamps and about 25 percent lives below the U.S. poverty level -- that price tag cannot be paid with local tax revenue. "It is not possible and it is not fair that the island bear the cost," Woo said. At the peak of construction, the buildup would increase Guam's population by 79,000 people, or about 45 percent. The EPA said the military plans, so far, to pay for public services for about 23,000 of the new arrivals, mostly Marines and their dependents who are relocating from the Japanese island of Okinawa. Ceded to the United States by Spain in 1898, Guam is a U.S. territory. Its residents are American citizens, but they cannot vote in presidential elections and have no voting representative in Congress. The Marine Corps is sensing a populist backlash on Guam, which is three times the size of the District of Columbia and more than 6,000 miles west of Los Angeles. "I see a rising level of concern about how we are going to manage this," Lt. Gen. Keith J. Stalder, the Hawaii-based commander of Marine forces in the Pacific, said in a telephone interview. "I think it is becoming clearer every day that they need outside assistance." The White House said Obama included $750 million in his budget to address the civilian impact of the relocation and has asked Congress for $1 billion next year, but Guam officials say they have received no assurances from the federal government that the money is headed their way. Full Story on Washington Post. 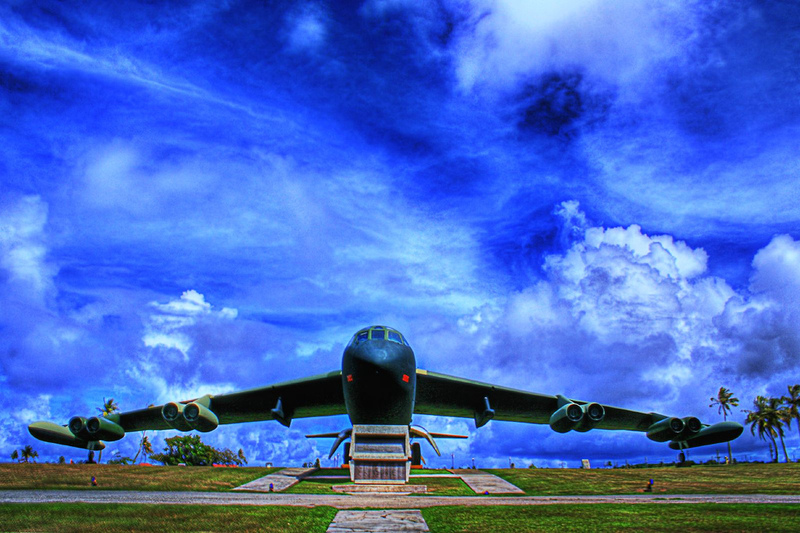 Photograph by Flicker user harogi of Air Force Base in Guam.